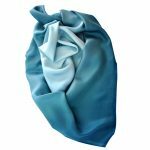 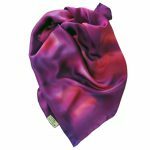 All Silk scarves begin life as white 100% best quality silk including Twill Silk, Crêpe de Chine Silk, Silk Georgette, Satin Silk and Silk Velvets. 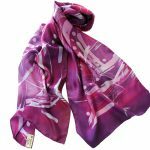 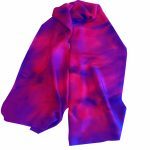 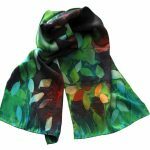 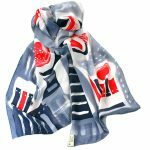 All scarves are hand painted not printed and are available in a variety of sizes the design is then drawn on the silk and hand-painted using Professional French Dyes, which are carefully blended to produce vibrant contrasts yet subtle tones. 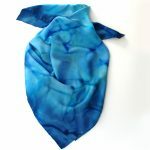 Kathleen is also a Batik painter and this technique is used in many of her designs. 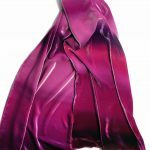 The scarves are then wrapped and steamed using a professional steamer to fix/seal the dye colours and reveal them in their full lustre and intensity. 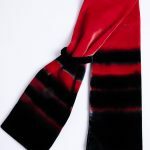 Finally, the scarves are hand washed and ironed and the edges of the Silk Scarves hand rolled and hand stitched. 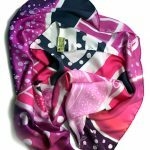 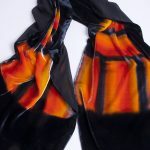 Each scarf is a unique piece of Art – a painting on Silk and makes for a very Special Gift with the luxury Silk and Velvet wraps designed for that very special occasion to enhance any outfit.